Barcelona is a city with a rich cultural tradition. 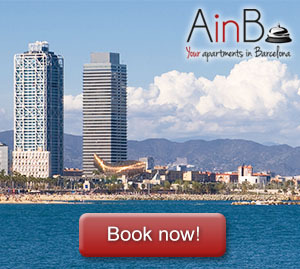 An authentic magnet for those who just want to enjoy a pleasant Mediterranean atmosphere with some ingredients like the sea, the mountains; Gaudí and modernism as just a small sample of its attractions forthose who want to live and be immersed in the excitement of a place cradle of the arts. It is also special for every student who wants to live the artistic inspiration of Barcelona to the elite culture; all visitors may find in Barcelona a place apt to develop their creativity. This was understood by three of its most international artists: Miro, Tàpies and, of course, Picasso. 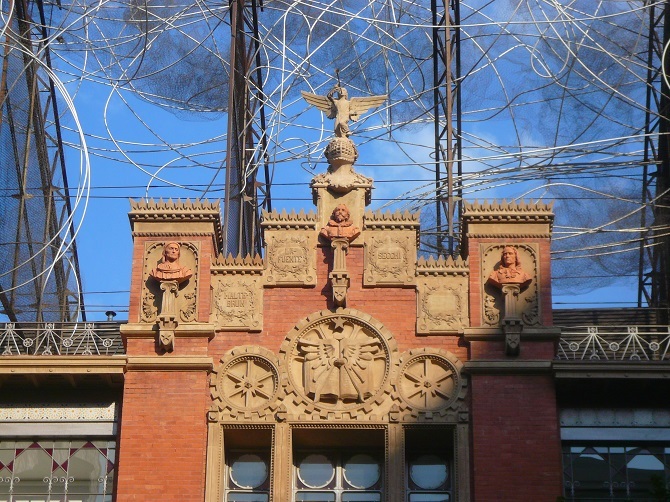 A sign that Barcelona is much more than Gaudi is that you can associate many artists who are equally appreciated. One of them is the great Joan Miró. To understand and appreciate the art of this great artist from Barcelona you do not need to go only to the Miro Foundation in the magical mountain of Montjuïc (although it is a must): his art welcomes us by land, sea and air and, directly and indirectly we can appreciate it in every corner of Barcelona. In the T2 of Barcelona International Airport we can find a magnificent and impressive mural which greets us just after landing and before taking the train, bus or taxi to Barcelona. 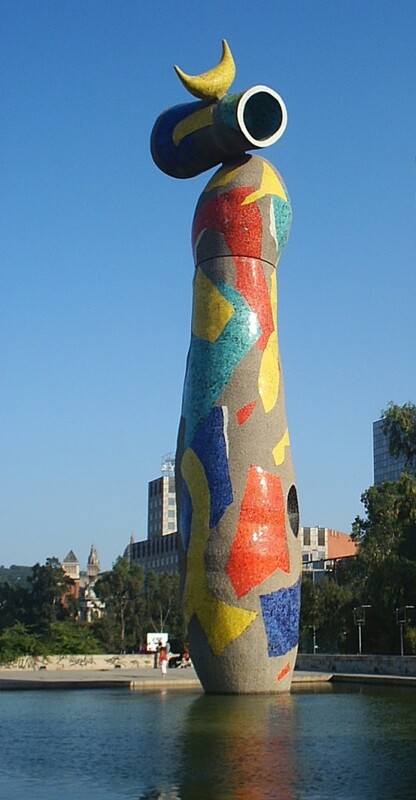 If we have the privilege of renting an apartment in the Parc Miró, a huge and iconic sculpture which refers to the Roman phalluses and which stood at the entrance as a sign of identity (despite its name, “Dona i Ocell” for which the translation from Catalan is “woman and bird”, it may be confusing). The sculpture greets the visitors and addresses directly to our imagination. Finally, facing the emblematic Teatre del Liceu we also find a mosaic of bright colors in the middle of the no less emblematic Ramblas, which greets us when we walk. If these three examples are not enough to observe how Miró intended to welcome us, we can also find his samples in almost every corner, in the offices of most Barcelonan banks, where we can see that the logo is designed of this unique artist. Following the footsteps of Miró and other artists of contemporary art, Tàpies continued making even bigger the fame of Barcelona as a city of modern art with sculptures and paintings not always close to the tase of the viewer but encouraging a very important part of contemporary art as the need to create confrontation and rupture with the classic. Apart from the artistic debates, we see his influence in Barcelona in his museum, which collects the post-modernist art from classical facade topped the tangle of wires so typical of his work, and are evident along the walk that leads to the epicentre of the Barcelona Olympic thanks to structures that decorate the entrance to the Stadium and the Palau Sant Jordi. Picasso doesn’t need a presentation; nothing else to say about the Malaga-born artist who, despite being from Malaga, developed most of his work in Barcelona, thanks not only to the charm that offer the apartments at the Born, where its most prestigious museum is located, but at a time when it was common to see in cultural cafes in town (although mostly Els Quatre Gats) discussing merrily characters worldwide famous and great intellectuals such as Picasso himself, Dalí, Gaudí, Isaac Albeniz, Ramón Casas and Santiago Rusiñol among others. Currently Woody Allen has been responsible of reactivating it on the Barcelona map. 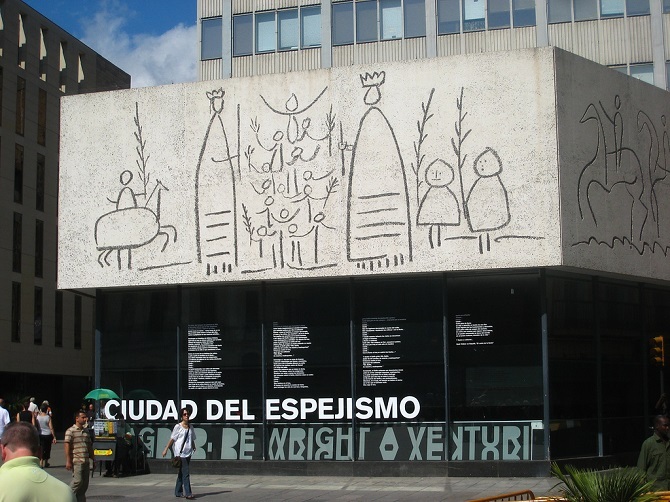 If the great palace which houses Picasso’s work is not enough, outdoors, facing the cathedral, we can see a frieze in the building of the College of Architects which was designed by one of the greatest reference of the 20th century Spanish painting.